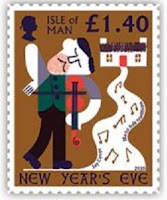 Here is another new issue of folklore stamps, which might be of interest to Fortean Philatelists, of which there are quite a few. The Isle of Man, midway between England, Scotland and Ireland, has a rich heritage of traditional lore from its Celtic and Viking history. 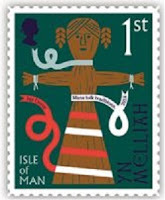 The description of the six stamps, is taken from the Manx Post Office publicity information. Celebrating the mheillea [1st class stamp] is typically found elsewhere, but on the Isle of Man it can be traced back to the goddess Luan - the spirit of the corn. Its meaning has changed over time, but many associate the word with the last sheaf to be cut, decorated with ribbons and presented to the Queen of the Mheillea; or the baban ny mheillea (doll of the harvest) which sat on the farmhouse kitchen chimney-piece. In recent times the word mheillea has become associated with a harvest supper and auction of produce. 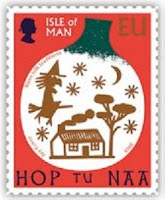 Hop tu Naa, (old style New Year's Eve) [European postal rate] Divination was widely practised, with particular emphasis on how womenfolk may discover the name of the man they would marry. The dumb cake (Soddag Valloo), which consisted of some unlikely ingredients such as egg shells and soot, was prominent. Each woman helped to mix the cake, and when baked and eaten would retire to bed backwards without speaking, hoping to see the drem image of their future spouse. Also known as Oie Houney (Hollandtide Eve) youngsters would have fun with simple games, the more mischievous disturbing their neighbours by banging on doors with hard cabbage heads! And then there's the mysterious figure of Jinny the Witch, who flies over the house but once a year, with variations of a curious rhyme in her wake. 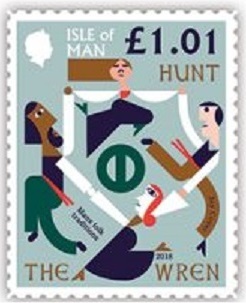 Despite its connotations, Hunt the Wren [£1.01 stamp] is another tradition which has remained popular across the Island. Originally they were hunted down, killed, and fastened to a pole, before processing in the neighbourhood, their feathers thought to ward off evil in the coming year. It's staunchly linked to St Stephen's Day (Boxing Day) but nowadays revellers use an imitation bird and sell coloured ribbons to those they meet en route. Celebrations for New Year's Eve [£1.40 stamp] tend to merge with the first day of the new year, but it was important to abide by a few rules if you wanted peace of mind. You might be woken by a local fiddler, bringing good cheer, but ill luck would attend anyone meeting a cat first thing in the morning and you would be advised not to lend anything on this day, for fear of doing so all year. The housewife would rake the fire and spread the ashes across the floor and in the morning look for a mysterious footprint. A death in the family during the year was indicated if the toes pointed towards the door, and a new arrival if they were turned towards the fire. But perhaps the most popular visitor to any household would be the quaaltagh, [£1.75 stamp] or first-footer in Scotland, who would bring gifts to a welcoming household and receive food and drink in return. 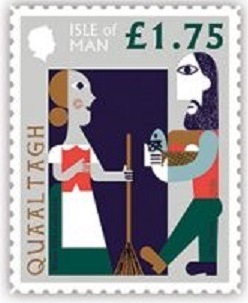 Although descriptions might vary across the Island, it was considered that the quaaltagh should be a dark-haired man who was not splay-footed. 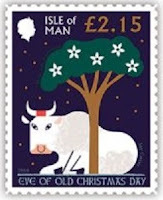 But there was something magical about the eve of old Christmas Day [£2.15 stamp] when the bees were said to emerge from their hives at midnight, bullocks fall down on their knees in unison and the myrrh (Sweet Cicely) is reported to come into bloom. P.S: We are, of course, sorry to see that there is no reference to Gef the Mongoose in this set. Perhaps the postal authorities are keeping that in hand for a forthcoming special issue!